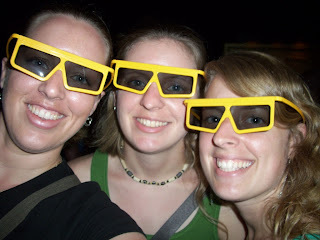 KT's Family Stories: My Birthday! 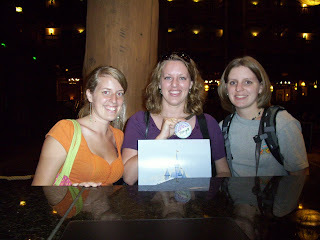 As I mentioned before, this year on my birthday (September 20) I met Amber and Sandra at DisneyWorld for 2 days! It was incredible! Instead of typing a moment by moment account here and losing you all, I am going to reprint here a very special page from my scrapbook of this trip. Interspersed in this list will be some of my favorite pictures from the trip. 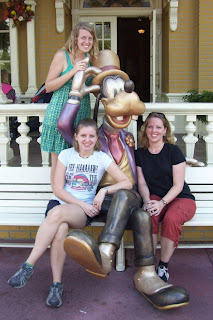 It was a trip to DisneyWorld with Amber and Sandra! 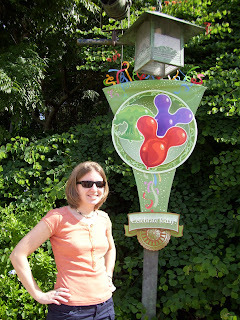 Sandra got us into three parks for free on the 19th! 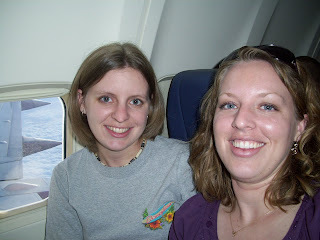 Amber provided the flights at no cost. 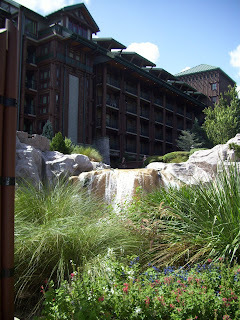 We stayed in a beautiful hotel courtesy of Amber, Sandra, Mom and Dad. I received birthday cards, calls, and gifts from lots of family and Jenise. Thanks to Sandra I got to shop at the Cast Member store where I bought a fabulous watch. I got to see where Sandra lives and works. Sandra Dodd spent the weekend with Kevin and Avery. I did not change a diaper for the whole weekend! 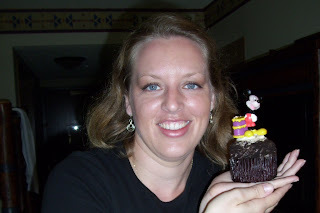 I had a gourmet cupcake with a Mickey Mouse candle on my birthday. We came away with lots of pictures and special memories. 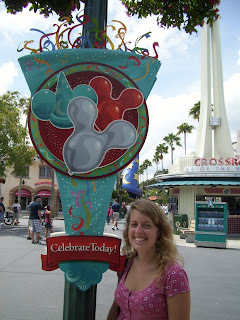 Did I mention that I spent my birthday at DisneyWorld?! And for all this I paid about $30 out of pocket! Nearly every cast member I passed for 2 days wished me a Happy Birthday. 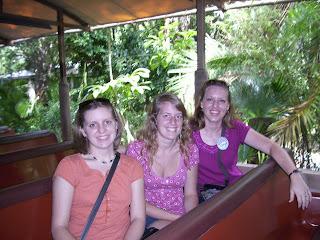 We rode the Safari ride on a private birthday tour. 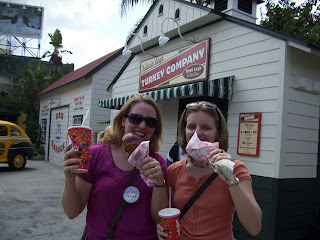 At lunch in the Studios, I got a turkey leg for the price of a 'gobble-gobble'. I received free chocolate dipping sauce for my pretzel, Yum. 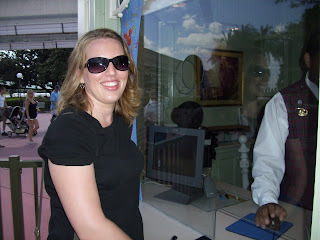 The day of my birthday I got FREE admission to the Magic Kingdom. At dinner on Sunday I received a mini chocolate cake. A Disney executive gave me the last pin I needed to complete my set, even though I ran out of pins to trade with her. 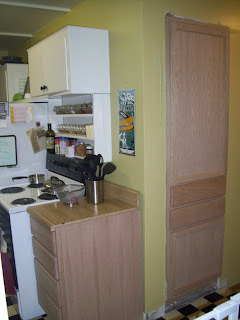 But at home, he had spent the weekend building me a pantry in the kitchen. Awesome! As you can see, my 29th birthday was extra extra special! I am still basking in the joy of the event! 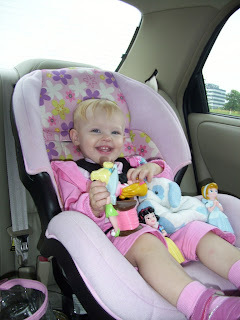 But now it is finally time to move into more current events, and I have some great videos of Avery coming up. WOW!!!WOW!!!!WOWWW!! !I am speechless. That was some awesome birthday! I am jealous!!! I am just seriously so excited for you. What a vacation!!! That is fantastic! That is marvelous! That is Terffic! Good for you! Happy Happy 29th! Happy Birthday! I don't know that any other birthday to come could top that one. 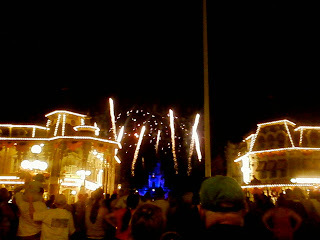 It made me want to go to Disney World for my birthday. Glad you had such a good time. Holy cow! What you packed in a few days was a lifetime of Happy, glowing memories! Yay for Kevin, Avery, Sandra (the sister), Amber, Sandra (the fabulous mother-in-law)and even us for making your 29th birthday come true for $30.